If you read our Tips and Tricks article on how to set up a 3-2-1 Backup system (read the article here), you probably realize you are going to need some external hard drives. There is no shortage of conventional hard disk drives available, but before you make a final choice, you may want to give the Crucial MX300 Solid State Drive serious consideration. 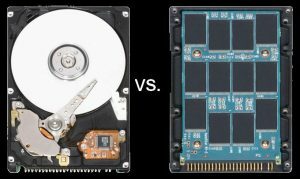 Before we look at the Crucial MX300 in detail, let’s review the difference between a conventional Hard Disk Drive (HDD) and a Solid State Drive (SSD). In terms of computer technology, the HDD is almost ancient. 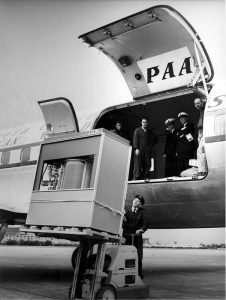 The first HDD was introduced by IBM in 1956 as the Model 350 Storage Unit. The Model 350 contained 50 24-inch disks, for a total of 100 recording surfaces. Each surface had 100 tracks that turned at 1,200 rpm. The 350 had the capacity to store 5 million 6-bit characters, a total of 3.75 MB. Don’t even think about carrying it to another location let alone put it in your pocket. The Model 350 had a cabinet that was 60 inches long, 68 inches high and 29 inches deep and needed a fork lift to transport it. Of course, the Model 350 storage unit was of no use without a processing unit to go with it and IBM released the IBM RAMAC 305 with the Model 350 storage unit. The entire system was the size of two refrigerators, weighed over a ton and could be rented from IBM for $3,200 per month. We’ve certainly come a long way in 60 years. Today, for less than $100.00, you can buy a HDD that can fit in your pocket and store more data than would fit on over three million Model 350 storage units. Although time has improved the HDD, it hasn’t changed the basic technology. Today’s HDDs use the same concept of spinning magnetic disks and floating heads to store your documents, photos, videos and music on your computer, in much the same way as the Model 350 did. Unlike HDDs, the solid state drive has no moving parts. Data is stored on a series of memory chips that are managed by an internal controller. Because there is no motor to spin the disks and no moving arm to read and write data, the chances of “crashing” the disk or damaging the contents is greatly reduced. SSDs also run cooler than the conventional HDD which led to some computers not needing fans to help keep the system cool. You can see a brief video explanation of an SSD in the video below. Even from the earliest days of the personal computer we have been using some form of solid state memory as the Random Access Memory (RAM) in a computer. But that memory was volatile meaning whatever data it contained was lost when the computer was shut off or the power was otherwise interrupted. The first popular, low cost, non-volatile memory was the flash drives (a.k.a. key drives) that became popular several years ago. Although solid-state hard drives also have their earliest history in the 1950, it wasn’t until the early 1990s that the first commercial SSD was introduced. It held 20MB of data and cost $1,000. Compare that to Crucial MX300 SSDs available today which have thousands of times the capacity at a fraction of the cost. Crucial is no stranger to computer memory, with over 35 years of experience providing all forms of memory products to the computer industry. They were also one of the first memory companies to sell directly to end users rather than to equipment manufacturers. In 1998 they introduced the Crucial Memory Advisor™, which gave computer owners a fast and easy way to determine what memory options were available for their computers. The Crucial M500 was the world’s first terabyte-class SSD for under $600. The Crucial MX300 SSD comes in a standard 2.5” form factor so it can be used in almost any situation where a conventional 2.5” HDD would be used. The MX300 is available is several sizes starting at 275GB all the way up to a 2TB model. Our test unit was a 525GB model. All of the MX300 SSDs are only 7mm thick but a 2.5mm spacer is included in the box to accommodate installations that require a thicker drive. Our 525GB MX300 is rated at speeds of 530 MB/s Read and 510 MB/s Write. The Crucial MX300 uses only 0.075 watts of power compared to 6.8 watts for typical HDDs. That results in extended battery time when using your laptop. The Crucial MX300 line comes with a 3 year manufacturer’s warranty. Also in the box was a certificate for Acronis True Image Backup software. Although the 2017 version software is available for Macs on the Acronis web site, the link provided by Crucial is for a 2015 Windows version of the software only. When we first connected the Crucial MX300 to our Mac we got the following message. We suspect, given the size of the drive, that it comes preformatted in the NTFS format used by modern Windows machines. This really isn’t an issue since we intended to reformat the drive to the native HFS+ used by MacOS and clicking “Initialize” opened Disk Utility and we quickly reformatted the drive and mounted it on our desktop. Most people use a SSD to replace the HDD in their computer and we’ll talk more about that in a minute. What we wanted to see is whether it pays to use an SSD as an external hard drive to compliment a back-up strategy. To see how the Crucial MX300 compares to a conventional hard drive, we ran multiple A/B tests in several real world situations. In addition to the MX300 SSD, we used a WD 2.5” 1TB HDD. We mounted the drives in a Aukey USB 3.0 Drive enclosure to hold the HDD and SSD during our testing. We particularly like the Aukey enclose for is sleek design and tool free drive installation, which made swapping the HDD and SSD effortless. First we tested a 2009 MacBook Pro which has USB 2.0 and is running OS X Yosemite. We started with the conventional WD HDD mounted in the Aukey case. We tested the speed using the BlackMagic Speed Test application and got Write Speeds of 31.1 MB/s and Read speeds of 34.3 MB/s. We then used SuperDuper! to clone the Mac’s internal 320GB hard drive, which has about 258GB used. We made the clone to the freshly formatted HDD which took 5:45:11. 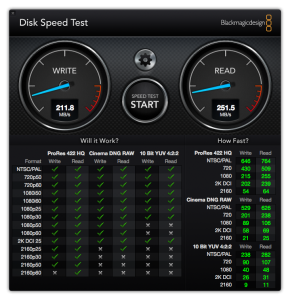 We then swapped the HDD for the Crucial MX300 and ran the same speed tests. Speeds for the SSD were only slightly faster at Write 36.4 MB/s and Read at 37.2MB/s. The clone to the freshly formatted Crucial MX300 completed in 5:10:54. That might not sound like a big difference but it actually works our to an 11% improvement in the time it took to clone the same data. Imagine how much more productive you could be with 11% more time in your day. We next ran the same speed tests and clone using a current MacBook Air, which has USB 3.0 and an internal 500GB SSD, with 203GB of data. Using the same conventional hard drive in the same Aukey case, we got Write speeds of 71.2 MB/s and Read speeds of 72.6 MB/s. Our clone of the internal HDD took 1:41:26. When we switched to the Crucial MX 300 we got Write speeds of 356.9 and Read speeds of 263.6. This time, our clone took 1:15:36. That represents about a 25% speed improvement. It seems pretty clear that regardless of the system you are using, there are significant benefits to using the MX300 SSD in a USB 3.0 enclosure as part of your back-up strategy. As we said earlier, most people consider a SSD to replace the HDD in their older systems. We decided to see what would happen if we replaced the 320GB HDD in our 2009 MacBook Pro with the Crucial MX300. With the stock Apple 320GB HDD we saw Write Speeds of 36.9 MB/s and Read speeds of 40.0 MB/s. After cloning the stock HDD to the Crucial MX300, we installed the SSD into the MacBook Pro. With the Crucial MX 300 the Write speeds increased to 211.8 MB/s and Read speeds to 251.5 MB/s. 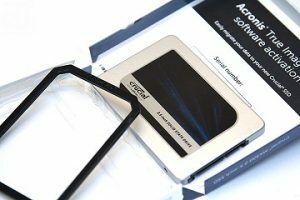 While those speeds are only about have of the top rated speeds of the Crucial MX300, it represents about a 600% performance boost in our 2009 MacBook Pro. There is no question that the Crucial MX300 made our MacBook Pro feel like a new Mac. While SSDs have come down in price in the last few years, they are still more expensive than a conventional HDD. The smallest MX300 (275MB) has an MSRP of $79.99. That is a very competitive price, but the same money will buy 2 – 4 times more storage in a conventional HDD. That said, if the smaller size meets your needs, we would rather have the speed and reliability of the Crucial MX300 over the larger capacity. Our 525GB MX300 has an MSRP of $124.99. That works out to about 24 cents per GB. A 500GB Seagate Backup Plus Slim HDD can be had for around $64.99 (13 cents per GB). As you move to larger size drives, the price difference becomes a little more dramatic. Not because SDDs get that much more expensive but rather because HDD storage gets cheaper. The Crucial MX300 in the more popular 1TB size has an MSRP of $249.99 (about 25 cents per GB). The same Seagate Backup Plus Slim in the 1TB version is actually cheaper than the 500GB model at $59.00, which is only 6 cents per GB. For comparison, at 2TB, the cost of the MX300 remains 25 cents per GB but the HDD drops to a mere 4 cents per GB. The Crucial MX300 SSD is a great choice for anyone interested in a SSD. The increased speed and lower power consumption offered by an SSD would be enough to convince you that an SSD is a superior option. But is it worth the price? While we saw moderate speed increases on an older MacBook Pro with USB 2.0 when we switched from an HDD to a SSD, but that appears to be related more to the USB 2.0 connection than the Crucial MX300. If your needs require a large capacity drive, we’re not sure the modest speed difference is enough to justify the extra cost of an SSD. 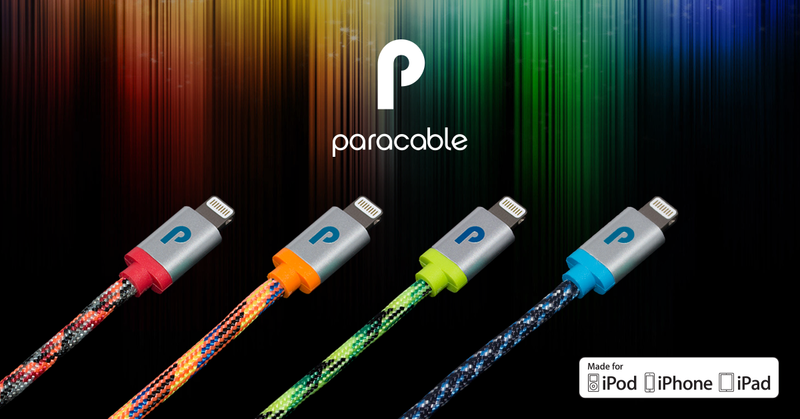 That completely changed when we did the same tests on the MacBook Air with USB 3.0. We would gladly pay the premium price of the Crucial MX300 to get 5 or 6 times the speed on an external drive. For those people that have older MacBook Airs with smaller internal SSDs, we think it would be money well spent to go with the Crucial MX300, especially if you only need one of the smaller capacity drives. For anyone who has an older MacBook or MacBook Pro with an easily accessible hard drive, it’s pretty clear that regardless of the size you select, putting a Crucial MX300 SSD in your laptop will not only provide the added protection that an SSD gives, but it will put new life into your Mac which may have otherwise been showing its age. At $249.99, you can double or triple you internal storage and potentially adds a few more years of life to your Mac. The Crucial MX300 SSD is available directly from the Crucial web site and also available from Amazon. 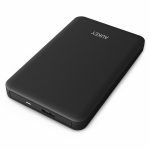 If you intend to use your Crucial MX300 as an external SSD, we also recommend the Aukey USB 3.0 Drive enclosure, also available from Amazon. We wish to thank the folks at Crucial for providing a MX300 SSD for our review. Have you upgraded an older computer with an SSD? Do you plan to purchase an SSD to use as an internal or external drive in the future? 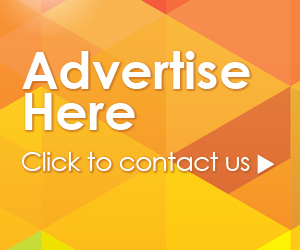 Why not join the conversation and leave a comment below.